Following the death of the club’s owner Vichai Srivaddhanaprabha on Saturday, players and officials of Lecicester City will not be flying to Cardiff for their next premier league fixture in Wales. The Foxes will go by road on Friday after making the decision flying would be insensitive given the circumstances of chairman Vichai Srivaddhanaprabha’s tragic death, Press Association Sport understands. Srivaddhanaprabha died on Saturday, along with four others, when his helicopter crashed after taking off from the King Power Stadium. Leicester City’s Premier League fixture at Cardiff City this Saturday (3 November) will go ahead as scheduled, as the Club continues its tributes to its late Chairman, Vichai Srivaddhanaprabha. On Tuesday evening, Leicester announced the Cardiff game will go ahead having postponed their Carabao Cup game with Southampton, which was due to be played on Tuesday. The club had discussed whether to play the fixture in Wales but it will go ahead after backing from the players and staff and there will be a minute’s silence prior to kick off, while the players will wear black armbands. Books of condolence have been opened at the King Power Stadium and are available from 8am to 10pm every day. An online book can also be signed via the club’s website. Two members of the chairman’s staff, Nursara Suknamai and Kaveporn Punpare, and pilot Eric Swaffer and his partner Izabela Roza Lechowicz also died in the crash. Tributes from fans and players have continued to grow outside the club’s North Stand while a group of Buddhist monks held a service on Tuesday. 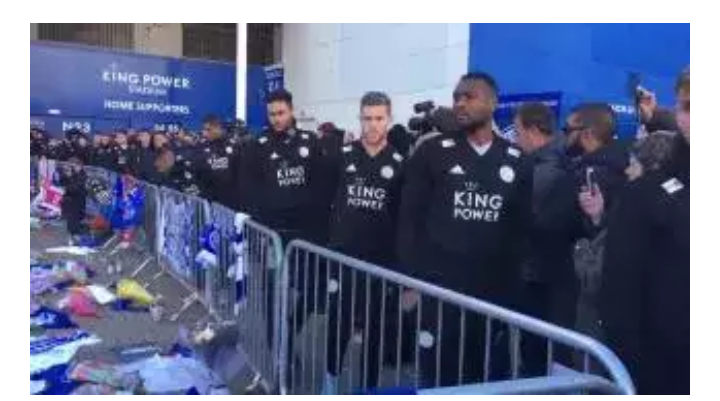 Players, including Jamie Vardy and the injured Daniel Amartey, made separate trips to pay their own individual respects. The Air Accidents Investigation Branch (AAIB) continue to conduct its investigations as it tries to establish what caused Saturday’s tragedy. The aircraft’s black boxes have been recovered and are being studied in Farnborough.